Live Decorative Grade Straight Fin Koi drop shipped direct to you. - FREE SHIPPING! 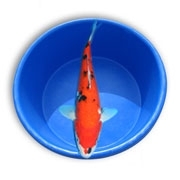 These Decorative Grade Koi are for the fish owner who does not care about the quality of the fish's markings but wants a variety of nicely colored fish that make terrific pond or water feature pets. Fish will be a hand pick selection of different colors and markings.